How high are realtors´ and lawyers´ fees in Belgium? What about other property purchase costs? 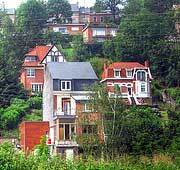 How difficult is the property purchase process in Belgium? After deciding what property to purchase, the prospective buyer signs an agreement to purchase (compromis de vente or verkoopcompromis). This immediately commits the buyer to purchase the property, given that the seller acts in good faith. The buyer and the seller are each represented by a legal counsel or notary. There are fixed state-agreed costs for the services of the notary. These costs also vary depending on the property but on the average, it is around 1.6%. In general, real estate can be acquired by simple agreement. Usually, a binding, private written contract (acte authentique or authentieke) is entered into subsequent to the notarized sales agreement. Such a contract is usually drafted by legal counsel and may contain conditions upon which the validity of the sale is dependent. At this time, a deposit of usually 10% of the sale price is made, and placed into an escrow account until the notarized deed is issued. After the signing of the notarized deed by both parties, keys will change hands. The sale should then be registered with the official registry within four months of signing the deed, when duties of 12.5% of the sales price become due. It takes an average of 62 days to complete the two procedures needed to register a property in Belgium. Registration tax of 12.5% is payable for most properties. Registration tax of 10% applies to Flanders. For downmarket properties with revenu cadastral/kadastral inkomen below €740, registration tax can be reduced to 6% (5% in Flanders). For properties that are new i.e. less than two years old, a 21% VAT is payable by the buyer . Hence, new properties have a higher registration fee. How landlord-friendly is the law in Belgium?